I was never this pale, honest! I have become so pale lately and finding concealers and foundations to match me has been a nightmare! 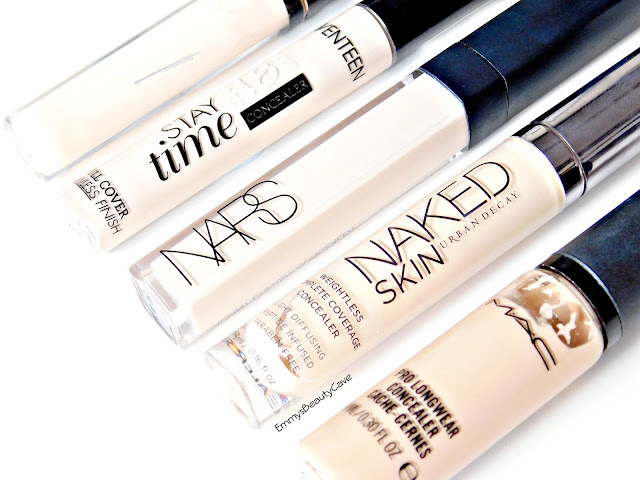 I have found some concealers which I swear by and that are perfect for pale skin but they all have different uses. Pale skin and dark skin tones are so hard as alot of brands seem to only cater to people with medium type skin tones. I know L'Oreal was one of the worst but they have now released a huge range of shades perfect for pale and dark skin tones! If anyone is wondering I am when not tanned around a NW20 sometimes NW15. I had always been more medium toned until I became house bound 2 years ago after an accident. It isn't until now I realise how much just being in normal daylight everyday colours your skin. I am now the perfect shade of ghostly white! I have the shade NW10 which is pink toned. As with MAC NW is pink toned and NC is yellow toned. NW15 and NC15 are the lightest shades in this concealer but it is perfect. In person this MAC shade comes up a bit lighter than it is showing in my swatches. This is a high coverage concealer and a little goes a long way! I swear by this for my under eyes as it isn't heavy or cakey. I have the shade "Light Neutral" which is the second lightest shade but I also have "fair neutral" which I couldn't find when doing this post, Light Neutral is still really good for fair skin and there isn't a massive difference between this and fair. It is the most creamy concealer I have ever used. I find it doesn't fully cover my dark circles unless I use it with my Becca Under Eye Brightening Corrector but it is amazing at highlighting on pale skin. Ok this concealer I personally don't like but alot of people do love it. On me I found it did cover my dark circles but it really dried out my skin. My skin is an oily mess so I was surprised to find this dried it out. The shade Chantilly is the lightest shade and perfect on pale skin. I do use the Maybelline Fit Me concealer which people say is similar but I really don't see it. Now this is my favourite drugstore concealer! 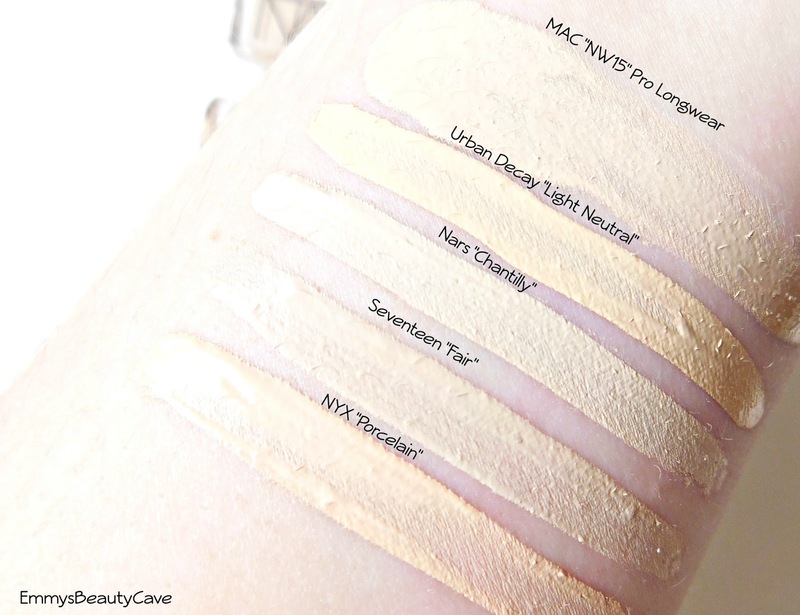 Seventeen are amazing for us pale girls, in concealers and foundations they have the shades perfect. They do need to get darker shades so it would suit everyone. This is a full coverage concealer, very creamy and doesn't get cakey! I find this is more of a neutral shade so it isn't pink or yellow which sometimes works better on pale skin. I love this concealer, I have the shade Porcelain which is on the pink side. If you are paler than a NW15-NW20 this may be too dark on you so I would recommend the Seventeen one! I love how light this feels on my skin whilst still having a good amount of coverage. NYX now also sell this concealer in colour correcting shades including Green, Lavender and Yellow. Overall if you are extremely pale my top picks would be Seventeen Stay Time "Fair", NARS "Chantilly" and Urban Decay "Fair Neutral". If like me you are more of the MAC NW15-NW15 all of these would work amazing for you!